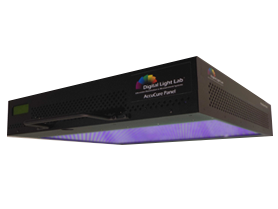 The AccuCure Panel family of products are innovative UV LED based flood light sources targeted for large area UV curing. Their architecture provides radiation patterns in range of several inches to several feet. Custom designs are available with no MOQs. Optional sectional based control enables providing different radiation pattern at different part of the panel. Companion controllers offer manual control or PC or PLC-based control and optional 4-20mA input. The Panels are available in different wavelengths such as 365nm, 385nm, 395nm, 405nm, 420nm, and others including hard to find. 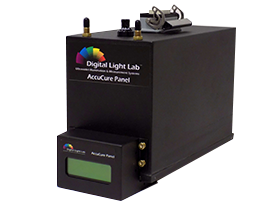 UV-B & UV-C like 265nm, 285nm, and 310nm are now available . Dual wavelength flood panel configurations are also available. 185mm x 185mm AccuCure Panel LED head with continuous or pulse mode of operation with flood beam pattern. 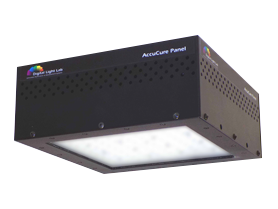 288mm x 288mm AccuCure Panel LED head with continuous or pulse mode of operation with flood beam pattern. 406mm x 590mm AccuCure Panel LED head with continuous or pulse mode of operation with flood beam pattern. 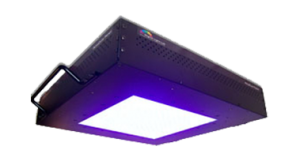 288mm x 288mm Dual Wavelength AccuCure LED Panel with flood beam pattern with independent and simultaneous multiple LED wavelength control. 203mm x 114mm High Powered LED Flood Panel intended for high speed production UV curing applications.